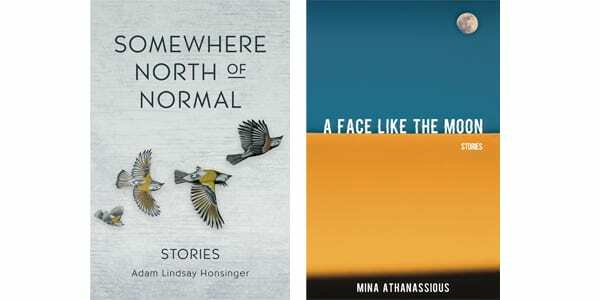 Two new short-fiction collections by emerging male writers – Somewhere North of Normal by National Magazine Award–winning writer Adam Lindsay Honsinger and A Face Like the Moon by debut author Mina Athanassious – explore divergent dimensions of the current Canadian cultural moment, each through a very specific stylistic approach. Honsinger – a musician, teacher in the University of Guelph writing program, and illustrator (his own artwork adorns Somewhere North of Normal’s cover) – crafts stories that are deeply interior and psychological. The stories of Toronto-based Athanassious, which focus on the experiences of children and are set across the Coptic Christian disapora from Canada to Egypt, are intensely concerned with the visceral – and often bloody – experience of complex minority identities. Considered together, the books demonstrate the richness and challenges of cleaving so starkly on the real or the surreal. The stories in Honsinger’s collection stubbornly resist the strictures of realism in their approach to theme, mood, setting, and plot. They were written across a span of well over a decade – during and after the composition of the author’s well-received debut novel, Gracelessland, which concerns the institutionalization of a high school student who attempts to free a family of primates from a local zoo. Featuring a range of characters – a pair of drug-addicted homeless teens, several theatrical characters, an entomologist trapped alongside his brother down a deep well – the individual entries adhere to the foreword’s stated premise with varying degrees of intensity. Honsinger’s stories crackle with depth of mood and theme. A lingering sadness grounds the collection, and thematic explorations of class and disability, intergenerational trauma, settler colonialism, and suicide ideation leave the reader provoked, shaken, and moved. In “Low and Away,” an abusive, alcoholic husband and father is directly compared to the neighbour’s mad dog. The man’s young son, caught in the middle of familial violence, lashes out at one of the story’s two violent creatures. “The Uncanny Demise of Jimmy Gardner” profiles a chronically depressed middle-aged man who revisits his childhood as he considers taking his own life. “Hamartia” may be read as a dramatic monologue by a histrionic and hilarious theatrical character; the story’s ending is both fantastical and poetic. In “The Art of Dying,” the collection’s most affecting story, a young man’s entire romantic life is defined by the moment when, at age 13, he encountered his father’s post-suicide body in the bathtub. Encounters with death are also prominent in Mina Athanassious’s debut collection, which is dedicated “to the 21,” a reference to a 2015 terrorist incident in which 21 Egyptian construction workers living in Libya were kidnapped and beheaded. In plain prose enlivened by stark imagery, Athanassious focuses on children and young people from Egypt’s Coptic Christian minority, whether in Tahrir Square or Toronto. No matter where they are situated, the lives of Athanassious’s characters are marked by difference and discrimination. In “Breathe Life,” eight-year-old Tino struggles to come to terms with the death of his mother, a victim of a church bombing. Tino and his father move to Canada, only to be humiliated by a racist police officer. But the story is neither simple nor didactic; the officer – also a person of colour – gets an unexpected and violent comeuppance himself. Where Honsinger’s stories occasionally suffer from a lack of tonal variety – told almost exclusively from a male first-person vantage with little sensory input – Athanassious is quite intentionally panoramic, sharing with the reader the sights and sounds and smells of youth in a range of circumstances from an unnamed male teen who is dumped by his family in Mokattam, Egypt’s “Garbage City” to Nijma, who begins working at a brothel at age seven. Both these collections neatly demonstrate how the borders of the world can at times seem expansive and, at others, paralyzingly small.